SIX OF ED Sheeran’s 7 Irish concert dates have sold out after tickets went on sale at 9am this morning. Over 300,000 tickets have been sold so far today, making it the biggest ever number of tickets sold by an artist in Ireland in one day, according to event organisers Aiken Promotions. The last date that’s not sold out (as of 5.50pm) is Wednesday 16 May at Phoenix Park Dublin. There’s only a limited number of tickets left there. Some eager fans have been queuing up outside Ticketmaster outlets since Thursday to make sure they secure tickets for Sheeran’s ‘Irish Tour 2018′. Others who went online to purchase tickets waited in a “virtual queue”. Tickets for Ed Sheeran’s 2018 Irish Tour went on sale at 9am this morning from Ticketmaster. Please bear with us as there are lots of people at outlets and lots of people online purchasing tickets and Ticketmaster are getting through everything as quickly as possible. 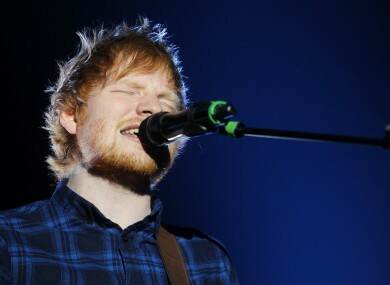 Sheeran will play gigs in Cork’s Páirc Uí Chaoimh, Boucher Road Playing Fields in Belfast, Pearse Stadium in Galway and the Phoenix Park in Dublin. The popular singer played two sold out shows in Croke Park last year, as well as two gigs in the 3Arena in April, which sold out in five minutes. In an attempt to clampdown on unauthorised selling of tickets, the person who purchased tickets on their credit card will have to go to the concert themselves. If it’s a case where a parent bought the tickets on their credit card for their child, the child will need to present a copy of the card as well as ID showing the family name. Email “Six of Ed Sheeran's concerts sell out in under 8 hours”. Feedback on “Six of Ed Sheeran's concerts sell out in under 8 hours”.